In early 2016, UAF Assistant Professor Dr. Il-Sang Ahn from the College of Engineering and Mines approached the Earthquake Center with a proposal close to our hearts. 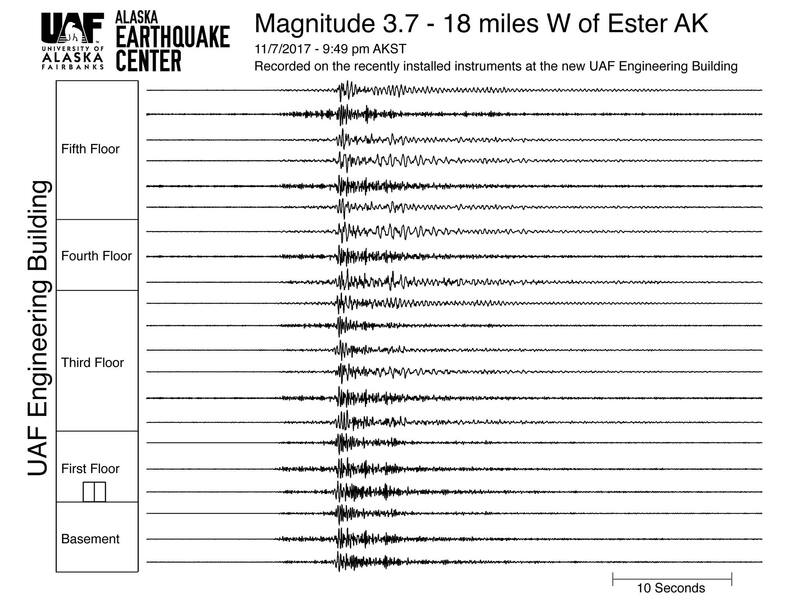 Would we be willing to work with him to equip the new Engineering Building on the Fairbanks campus—still under construction at the time—with seismic sensors for structural monitoring? Most of the Earthquake Center seismic stations are “free-field” sites, which means they are single instruments located away from buildings and other infrastructure. We use free-field sites to get the best possible recordings of shaking directly from the ground. Ideally, free-field sites have sensors attached directly to bedrock or at the bottom of a borehole, which reduces background noise and lets us detect much smaller earthquakes more accurately. This type of installation is perfect for detecting seismic activity. However, it's less useful for assessing how much acceleration, or shaking, people and buildings experience as a result of seismic activity. As it turns out, the fifty feet or so of earth below your feet makes a huge difference when it comes to how strong and how long you experience shaking during an earthquake. A house on built on poorly consolidated soils such as sand, silt, or gravel can experience accelerations an order of magnitude greater than a house built on solid rock. The folks in Anchorage saw this very phenomenon in action during the January 24, 2016 M7.1 Iniskin earthquake. A great recap of this event by the Anchorage Daily News can be found here. Going one step further, different locations within a building can experience accelerations differently. We usually think of a building as a rigid structure, but they move and sway not just during earthquakes, but under something as innocuous as wind as well. Individual buildings are designed to handle a certain amount of sway, but it can be very difficult to determine how much they move without installing instruments inside the building. When a building is structurally monitored, it usually involves multiple sensors on different floors and sometimes on different sides of the buildings. We can then compare data from the various sensors to determine how much different parts of the building moved relative to each other. By analyzing the recordings from these sensors, engineers can know when movement approaches designed limits and can know where to inspect to ensure that the building is still safe to occupy. Structural monitoring of buildings during earthquakes is not a new practice, but it has not often been done in Alaska. In many urban areas of the US west coast, buildings taller than 10 stories are required to be seismically monitored. The Atwood Building in downtown Anchorage is perhaps the most instrumented building in the state, with an array of sensors operated by the US Geological Survey located on 10 different floors. A great video showing the motion of the building during the Iniskin earthquake has been posted on YouTube by the USGS here. 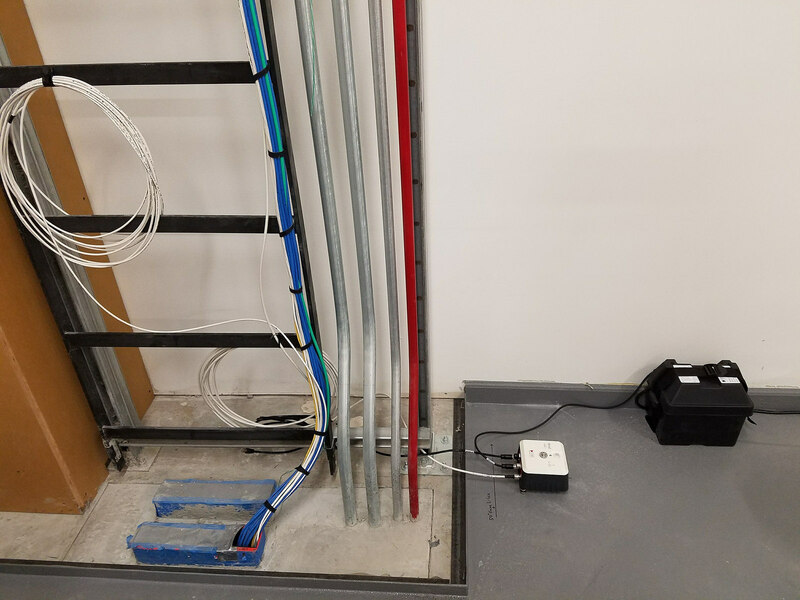 Earthquake Center technicians finished installing the building's sensor network in the summer of 2017. 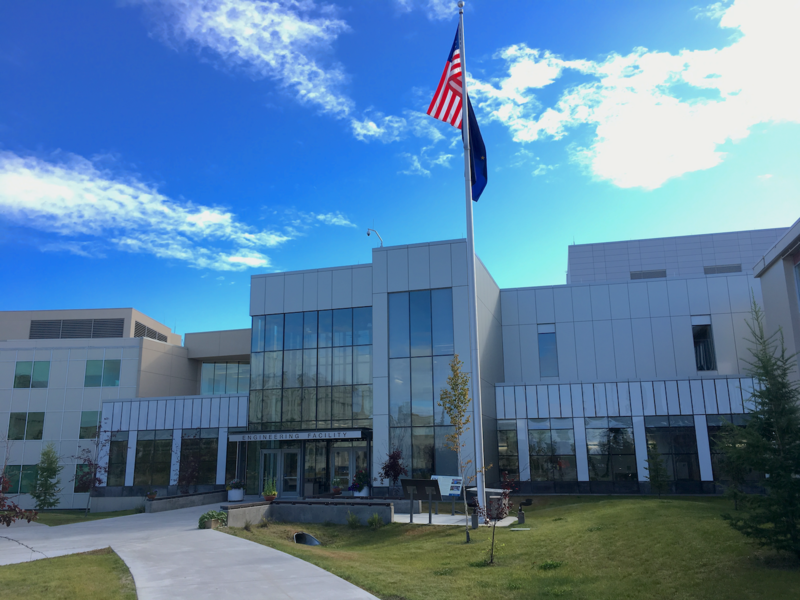 With seven sensors installed across five floors streaming continuous data in real-time to the Earthquake Center, the UAF Engineering Building is now one of the most instrumented buildings in Alaska. By instrumenting his department’s “home base," Prof. Il-Sang is using the information obtained to help train the next generation of geotechnical engineers with data directly recorded (and felt!) by his students.